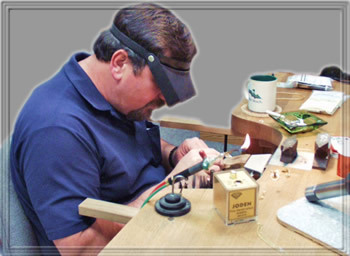 The repair and restoration department is an integral part of Joden Jewelers and is located on the premises of our 144 South Broad Street location. Established from the company's beginnings, this branch exists for the purpose of restoring your treasured heirlooms, as well as creating your heirlooms of the future. We have two full-time master craftsmen with over forty-five years combined experience in their field. These expert jewelers are able to skillfully and precisely work using on-site state of the art machinery, including bench mounted microscopes and the newly developed laser welding system, one of the few in the country. The combination of skill and high tech equipment now allows us to do certain complex repairs and restorations that were not possible even a few years ago. We invite you to come to us for the refurbishment of your jewelry or to design the ring of your dreams. There is no job related to jewelry that we cannot do.